In my humble opinion, there’s a lot of room for improvement. What if, instead, we approached this directory as the database that it really should be? 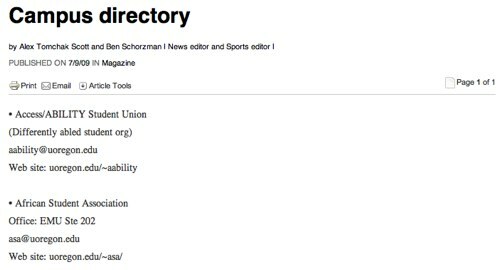 This web-native directory would have profiles for every student organization much like students can have profiles on Facebook. I’d be able to search for organizations based on the name, the location on campus, people currently involved, the mission of the organization, tags, etc. If I found a organization I was interested in, I’d click through to their profile. The profile would then give me access to all of the contact information I might need in addition to the most recent or popular articles, images, videos, updates from the campus’ microblog, etc. There’d be a small wiki section for the organization or sport where I could read up on its history and know that the information I was getting was true because it had been curated by the beat reporter. I see at least two advantages to this approach, in addition to making all of the information much more accessible (versus the flat text file). One, you’d only have to build this once. Two, you’d save the reporter or designer a lot of time having to search for the most up to date contact information because they could just pull the information from the database as they’re creating the print product. Think of role of the student news organization less as a newspaper and more as a platform for impartial, accurate community information to be shared. This is a framework for inventing a better Craigslist. It is highly unlikely that newspapers will reclaim the monopoly they had on classified advertising pre-internet. They controlled the platform before the internet, and were able to dictate what information used their print pages to gain readers and audience. Some newspapers have lost control of the platform completely and the ones that haven’t will follow suit. Newspapers won’t be able to reclaim the classified advertising space by using the old mental framework for thinking about classifieds, by pretending they might be able to own the platform and charge access to it. Instead, it’s imperative to take the approach of hacking the platform and adding functionality, value, and convenience. Remember Friendster? I don’t. I never had an account. It was upstaged by MySpace, where I had an account for a few months before it became uncool to do so. MySpace was then upstaged by Facebook. Yes, I’ll concede that MySpace has a large userbase, but its value in the mindspace of the users is rapidly diminishing and there’s a big need for creativity. Fortunately for everyone involved, there’s a low barrier to disruption on the internet. The real way local news organizations can upset Craigslist and build a better classifieds is simple: create a micro-currency. In addition to providing a more user-friendly interface and the ability to add better meta data, news organizations with a specific geographic community should establish a currency to “monetize” the local marketplace. As Douglas Rushkoff says, the web, and web 2.0 especially, is breaking existing institutions because it allows people to create value on the periphery again. Local news organizations are in a unique, and therefore advantageous, position to provide the platform with which to capture the value of local transactions. Last night, I realized we’ve started bitching about the Daily Emerald in the peanut gallery without offering any positive advice for change. I’d like to offer my thoughts on how to turn the struggling newspaper into a successful digital news enterprise. Step one: hold a transparent weekend (or weeklong) jam session to develop a strategic plan. Invite as many intelligent stakeholders as you can to a retreat, and put together a website for that retreat with the agenda, list of everyone involved, and goals. It might also be useful to have a open community forum in the week preceding to hear strengths and weaknesses from the perspective of the audience, or launch a website where the community and submit and vote on ideas for the news organization. When retreat happens, however, make it open and participatory. Make sure everyone at the retreat is documenting the discussion on Twitter, and livestream as much of the discussion as you can. Have a designated “community manager” for the retreat who looks for suggestions from watchers and brings those to the meeting. Tap the intelligence of the digital crowd, especially because you’ll be able to bring even more smart brains from afar. Step two: campaign over summer 2009 amongst the Daily Emerald alums to raise the funds necessary to implement the strategic plan. Shop the plan out to them to get their feedback and insights, and use CRM (or customer relationship management) software to track these interactions. When I left, they were using a FileMaker database system and analog mail. I would ditch this system immediately, and my first investment would be software like Salesforce.com (which a news organization could also use to sell advertising more effectively). Using the new CRM, it would be wise to fundraise amongst the alums who want to see their old newspaper experiment with this platform called the internet. Including them in the process, by sending them the strategic plan and a link to the website with an archive of all the video, will make them more invested in the process (if they like what you’re doing at least). Quit the College Publisher habit. Being on a locked, proprietary content management system is probably the worst foundation you could have for a digital news organization. Focus heavily on recruiting a few developers out of the computer science program, and build a basic website on Django that you can grow from. If you ask nicely, the Daily Gazette at Swarthmore or Daily UW might be willing to lend enough code to get you started. Move to once a week in print. I know that this would be very, very difficult, especially because the bulk of revenue comes from the print product, but it needs to happen nevertheless. Necessity is the mother of invention. Do it, and publish daily online. Empower your community. Break down the ivory tower, and hold workshops to teach interested community members how to report on the issues they’re passionate about. I am quite certain that club sports at the University of Oregon don’t get the coverage they deserves, and there are probably at least several people who could tweet at games and submit high quality images for a photo gallery. Right now at the Daily Emerald, though, they’re going about it the API emergency meeting way, and this is just one of the many reasons I think startups make more sense in this climate. I mean, look at all of the effort it’s going to take to turn this ship around, let alone reinvent it. There’s also been discussion that student news will be largely unaffected by the tornado ripping through regional newspapers right now. Even if that is the case, I would like to propose an analogy: if you’re driving towards the cliff of irrelevance, your direction is what is most important. It doesn’t matter that your car’s engine hasn’t seized up yet. As the project has been a very, uh, organic process, I thought I might clarify on a few points Greg made. First off, it is of my humble opinion that open source content management systems are philosophically better than proprietary. The key component to this argument is that you, as the developer or end user, are allowed to edit the source code with a platform such as Drupal, WordPress, or Django, whereas with a proprietary system like College Publisher you are limited to their ideas and their development cycle. News organizations not only need to be online, but they need to be able to innovate online. On top of that, in choosing an open source CMS we’re actually hoping student news organizations will take the initiative and start experimenting with how “news” or “journalism” is delivered. We’re different at the core because of this. This conversation is especially timely, too. I’m in the process of drafting documents to define what the specific vision of CoPress will be for the next couple of years. Really, we’re a lot more than hosting. CoPress Hosting is an attempt to get student news organizations to be on the same platform so that they can collaborate. The core of what CoPress stands for is the network of collaboration, and we’ll be experimenting with the best tools to make this possible. In the video, Greg mentions a conversation that arose organically in our Google Group. We want to create a platform, something I’m calling a social intelligence tool, that allows those types of conversations to happen more often and to create more value. The short goal is this: the tool will connect you with the person most likely to be able to answer your question (whether it’s troubleshooting a faulty plugin or install Apache). To my knowledge, this has never been done. We’re a pretty ambitious bunch, though, and I figure we’ll give it a shot. Greg also discusses the long-haul for the team. Personally, I never expected the project to get this big (it was originally going to be a 20% project at the Daily Emerald), so we’ve largely been making this up as we go along. We’re currently in the process of establishing six month, more formal positions, and my hope is that, if we start generating some sort of revenue stream, the core team will all be part-time positions. This is a bit different than what Greg said, but my logic is that I don’t think any of us (no offense to the team) is really qualified to do what we want to do. Part of it will be a learning experience, which will be valuable on its own, and part of it will be work, which it would be nice to be reimbursed for. On the plus side, we’ll be using the full genius of Joey Baker to put together a business plan and identify methods for long-term financial sustainability. If you wanted to build a completely digital student news organization from scratch, how would you do it? Which beats would you cover right off the bat? Would you cover club sports and campus sustainability, or the common news the student newspaper already covers? What form would your content take? Would you focus on text, images, audio, or video? For video, would you put together technically high quality multimedia pieces, or stream via Qik? How can you balance quality and quantity? How quickly would you try to scale? What benchmarks do you have for your organization at one month, three months, and six months? What would you do to advertise and get the community involved? What would the business side look like? Where would your funding come from? Would you sell advertising and/or have premium features? How much would you pay your staff? How would your platform compliment the stories you’re trying to tell? Would you start off simple with WordPress, or launch with something Django-based? What type of features would you want in your site to increase engagement with your product? Would you offer RSS, email newsletters, or content through social media? Most importantly, what type of people do you look for to help you build your vision? Threat one: Monetary. Advertising revenue dries up on the print side, print costs go up, and your online product isn’t compelling enough to generate the same type of revenue. That, or your online product is College Publisher and you can’t even boost the advertising revenue if you wanted to. One counter argument is that student newspapers could just go to student government to up their funding, a “bailout” of sorts, but I don’t think that could ever be a long term solution. Threat two: Staff disappearance. Students no longer want to work at their student newspaper because their industry of choice has a bleak future. Jessica DaSilva is already facing this challenge at the Independent Florida Alligator and, as I commented, this could be the greatest short term threat, especially if your paper isn’t perceived as all that digitally progressive. Threat three: Dearth of talent. Publishing and monetizing news online is quite different than print, and requires a skill set that potentially isn’t represented by current staff. The further a newspaper gets behind, the more it will have to invest when it does decide to make the gigantic leap in the future. This financing to buy talent might have to come out of its investments or from a significant fundraising drive. At the moment, this is threat identification and analysis. I don’t have exact solutions to any of these issues right now. My hope, though, is that by studying and mapping out the specifics of each threat we can develop strategic plans to make the transition and keep campus journalism alive. Why, adopt the technologies that are changing the media organization, of course. Disclaimer: I’m no formal contributor to this October’s Carnival of Journalism but, y’arr matey, I be boarding the ship anyway. Online publishing mediums are in flux and will continue to be as time progresses. This is a truth. At the moment, you’ve got RSS, a website, Twitter, blogs, etc. to deal with, all of which have distinct cultural assumptions as to content form. Were all of these distribution mechanisms around five years ago? For the most part, no. What mediums will be added in the next five? It’ll be interesting to see. There won’t be a stable “e-newspaper” product which parallels its predecessor, the print product. To my understanding, this is largely due to inherent qualities of the internet as a technology. It’s more of a paradigm shift than anything else. Journalism now has to contend with ever evolving distribution mediums. Websites, the mobile web, SMS, and the Kindle are all, ironically, examples of nearly the same thing, but not the same thing. There are different cultural expectations for content delivery depending on the type of device. In any regard, while going through Jeff Jarvis’s “New business models for news” slides, a few small to medium-size content/distribution projects relevant to the student media arena came to me. First, student news organizations should be compiling community blog round-ups. Synthesize the local discussions. There are surely at least a few students blogging on campus about various popular topics of the day. The recent political debates come to mind at the moment. News stories without links are static, but think of what would happen if you started quoting student blogs and encouraging participation. Bam, community. Furthermore, this organizing power increases if you do two things: have an email address where your audience can send in leads or links, and read regularly as many campus blogs as you can. Second, Twitter-source coverage of hot topics, especially politics. Obviously it shouldn’t be all of your converge, especially because Twitter only covers a certain demographic, but Twitter is certainly an interesting source of content. In Eugene, the Weekly Enema has almost scooped the Daily Emerald on this one. Lastly, build up your email newsletter product. Include a big image or two at the top, summaries of the leading stories, and a list of the most popular blog posts. Craft the newsletter just like you craft the paper, and get people to sign up for it. For some odd reason, I’ve heard more about this recently than our website (might it be that people haven’t discovered the wonders of RSS?). Tying your email edition to a CRM product and use the wealth of click data to create tailored, personalized emails. The business model, of course, is the elephant in the room. There are plenty of innovative minds working on this issue, however, and, with money to be made, I’m not too worried. Monetize as you evolve in tune with the changing formats. One of the rather positive outcomes of my case against College Publisher from a few weeks back has been the formation of a diverse group of people around a new project to provide an alternative: CoPress. A product of the sudden realization that many online editors across the country have many of the same opinions I do, CoPress is an initiative to build a technical eco-system of student newspapers working together and supporting each other on a common, open source content management system. Until this point, it has been largely the case that, when building and maintaining digital platforms, student newspapers have found only success on their own, with their own developers, creativity, and fortitude. We hope to change things up. Together we have strength. I think I can speak for everyone involved when I say that the collective vision of CoPress emphasizes the community, and how the community can work in harmony. Innovative, standards-compliant software is one immediate issue we’re trying to solve, but it isn’t the only one. Brian Murley, of the Center for Innovation in College Media, forwards that hosting is also an issue. From that discussion, we’ve also learned that supporting a piece of software with the technical expertise to keep it updated is critical. These problems will have to be addressed in order for any student newspaper to survive. It’s more powerful to work together than individually. We’re not profit driven, although the consortium will need to be financially sustainable. We’re driven by a genuine interest to work together because, when we do, we can create beautiful ways for student newspapers to flourish in the digital age. In the interest of radical collaborative openness, we’re doing as many things as transparently as possible. The motivation for this comes from a concept I call an “open source organization,” although I’m well aware “open source” has become a buzzword for many recent projects. It started with Whitman Direct Action, I’m evolving it with Oregon Direct Action, and I think is applicable here, too. The idea is simple: put all of the data about what you’re doing online, and structure the data such that your audience, let it be the team, the partners, or the community, can follow along to the degree they would like to participate. Clay Shirky says we have a lot of cognitive surplus floating around. It’s time we put it to use. Our conference calls are recorded and available as a MP3 download, with near future plans to create a podcast that will make listening in even easier. We synthesize research and coordinate efforts on our wiki. Information is also expressed with Twitter, delicious, and Flickr. We connect via a Google Group and, if you don’t find a piece of information you need, you’re more than welcome to contact CoPress. At the moment, we’re working on a few things. First, we’re beginning to research the software options we’re most interested in: WordPress, Drupal, and the Populous Project (built on Django). CoPress would love to support the Populous Project, another student project, and eagerly awaits their alpha release in the coming weeks. WordPress and Drupal, however, have deployability and hackability characteristics that will be hard to match. Second, we’re compiling the names of online editors, webmasters, and internet geeks at student newspapers around the country who might have interest in what CoPress will have to offer. From this, our hope is to do a series of surveys gauging the technical expertise in today’s newsroom. We want to make sure as best we can that we’re serving the needs of everyone, not just ourselves. Last but not least, we’re continually evolving our web presence as a tool to help better achieve our aims. And this is just the beginning. Thanks to Adam Hemphill, Greg Linch, Kevin Koehler, Joey Baker, Bryan Murley, Jared Silfies, Albert Sun, the Populous Team, and anyone I’ve missed. I look forward to working closely with you and others in the coming months to make all of these ideas and more our collective reality.